Joseph Macarthy is an urban planner with speciality in urban development planning and climate change adaptation. 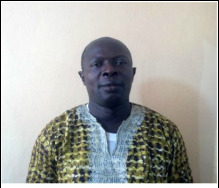 He is lecturer at the Institute of Geography and Development Studies. His research interest centres on urban planning and climate change. Joseph has a PhD in Urban Planning and Management from Newcastle University and MSc. in Urban Development Planning from the University College London. ​Apart from serving as a local consultant (urban planner) to the EU-funded Urban Planning Project for Freetown (in 2013), he also provides volunteer service to the UNDP as a member of the National Steering Committee (NSC) of the Global Environment Facility’s (GEF) Small Grants Programme (SGP) in Sierra Leone. He is also a Project Steering Group (PSG) member of the YMCA’s ‘Pull Slum Pan Pipul Project’ which it jointly implemented with Centre of Dialogue on Human Settlement and Poverty Reduction – Sierra Leone (CODOHSAPA) and Y Care International (UK).